There are two main supermarkets for everything you need. 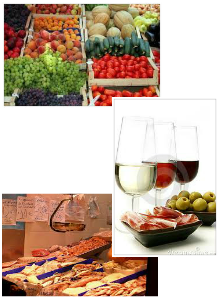 Alternatively, take a walk around the village of Coín and discover its many little grocery shops, bakeries and charcuteries where you can find cured meats, cheeses and of course great wines. For a true Spanish experience, sit in one of the local bars and enjoy chocolate and churros (an absolute must). Visit the weekly outdoor markets, where you can find fresh locally grown fruit, vegetables and artisan products. Alternatively if you just want to sit back and relax evening meals are available on request made from all locally sourced produce based on a Mediterranean menu , with an option of tasty vegetarian alternatives .